Characteristics: Thermally broken aluminum profiles (Uw=1,74 W/m2K), Double, tempered glazing (35mm) with thermal and acoustic insulation properties, perimetrical aluminum profile, parking, no bottom guide, insulation with elastic gaskets, thermally broken aluminum track rail driver. Basic dimensions: Lower and upper aluminum profile 105mm, aluminum driver 75x72mm, total width of intermediate vertical frames 60mm. The F4 Thermo is an improved version of the F4 Elite system, regarding the thermal insulative properties of the device. It is the ideal combination for maximum thermal insulation, water-tightness and sound insulation. It consists of panes with bear double glazing, framed with aluminum profiles with thermal breaks. Thermal breaks are created with striped of polyamides (a material with very low thermal conductivity) which are inserted between the inner and out part of the aluminum profile, aiming to prevent heat outflux to the exterior of the building. For even more protection, the F4 Thermo folding glass door system comes with a thermally broken track rail driver – yet another patented manufacturing technique by our company (Patent No 1008597). The total sum of these and other characteristics, results in a total thermal conductivity of Uw=1,74 W/m2K. The vertical aluminum profiles of the system have been designed to couple with each other with male-female cross-sections, efficiently sealing every gap. The also bear additional elastic gaskets to guarantee an absolutely air- and water-tight result. On the horizontal profiles sealing is also achieved with elastic gaskets. On every frame, a lock mechanism is installed at about the height of 1m - so that the user avoids bending down to secure the panel with floor locks. Each pane can be turned into an opening/divertible door, used as an entrance once a roof spring mechanism is fitted in. Such entrances can be both single and double winged, while an additional mechanism can be added to gently pull the wing back in position after opening. The thermally broken aluminum track rail driver from which the panes are suspended, has a cross-sectional dimension of 75x78mm. Maximum pane sizes can reach 300cm in height and 120cm in width. The opening/divertible door cannot be more than 100cm in width. Maximum allowable weight for each pane is 150kg. An endless range of applications, from residences to restaurants and night-clubs, offices, libraries, hotels and more. 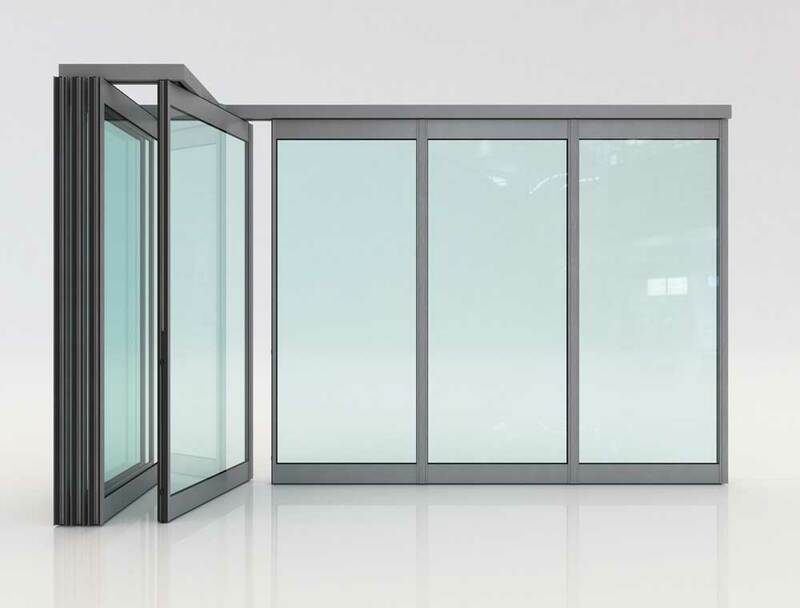 Thanks to its insulative glazing and thermally broken aluminum profiles, the F4 Thermo glass folding door system significantly contributes to lowering thermal losses in buildings, and protects from extreme weather conditions. Just as with all F4 system, the F4 Thermo offers the possibility of adding blinds inside the double glazing, to keep direct sunlight out. Another proposal which may add an interesting touch to a design is the addition of horizontal aluminum profiles between the glazing, to create the image of split windows. Energy savings: Thanks to its thermally broken profiles and double glazing, energy savings are maximized. Design Flexibility: Total flexibility regarding the configuration of the parking area, as well as the number and dimensions of the panes. Elegant aesthetics: The F4 Thermo folding door system maintains an elegant appearance, although it is designed to be a robust, high-performance insulation system.